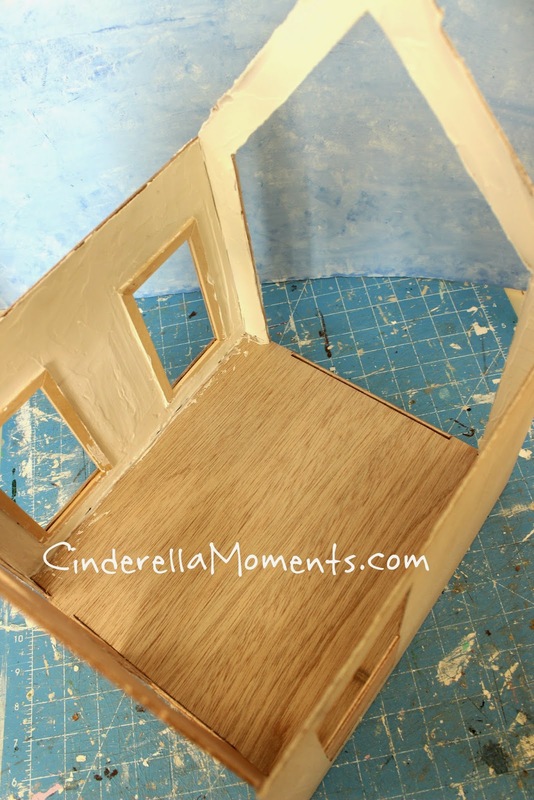 My newest dollhouse commission is for Cami. And the name says it all- a "Tranquil Nordic Retreat" which will be with the Shabby Chic Dollhouse as a base. 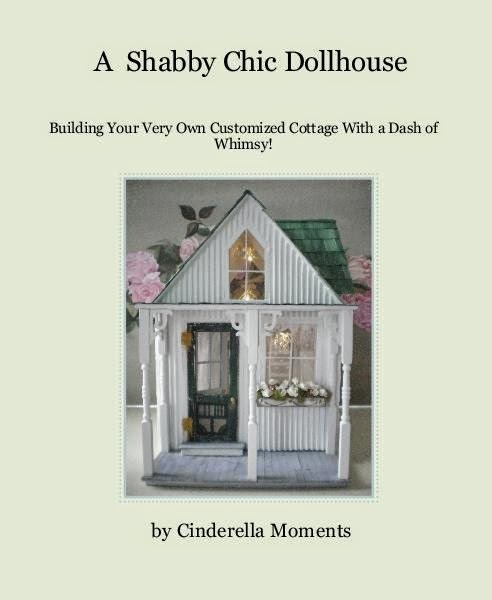 If you want to buy the book to show you how to build the Shabby Chic Dollhouse you can get it directly from the publisher Blurbs or from my Etsy shop Cinderella Moments. 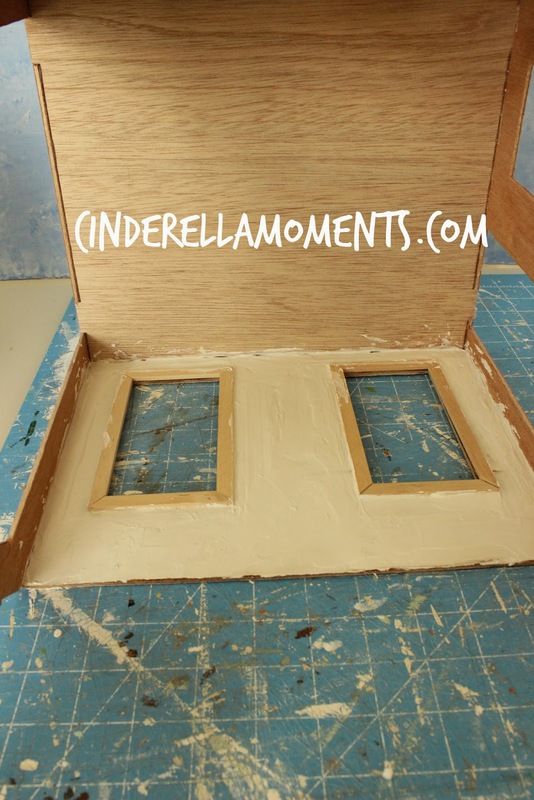 I put all four walls together with the floor and framed the 2 side windows. Then I used DAP's Joint Compound (bought mine at Lowe's)as my plaster. To spread it on the wall I used an artist's angled spatula. It's in the oil paint section at the craft stores. Once the plaster is on the wall, I smooth it as much as I can by dipping my spatula into a glass of water. Then glide the straight edge of the spatula over the plaster until you have smoothed it as much as you can. 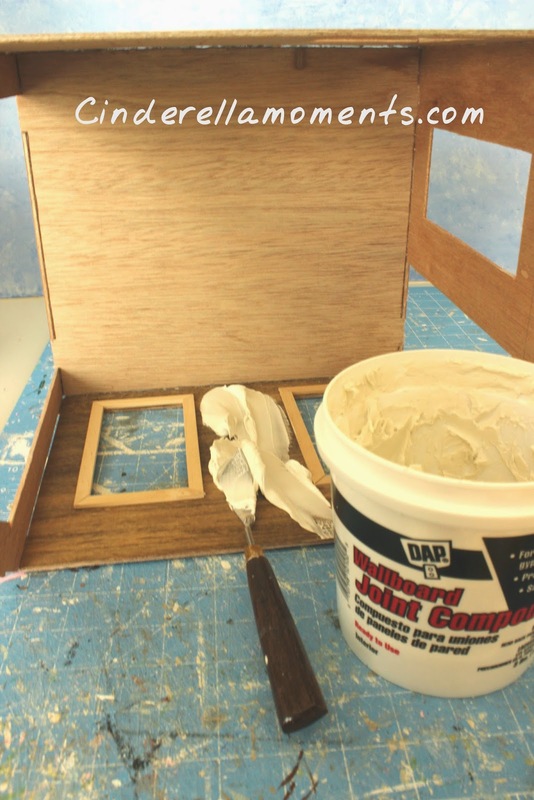 If you want a museum smooth finish just use a very gentle grit sand paper. But for this Nordic look I will need it to be just a little rustic. So smoothing it down with a wet spatula will give me the perfect look. I also did the back wall the same way. Sometimes I draw lines in the wet plaster to make fancy panels. But this house will need to have these 2 walls stay simple. I really enjoy seeing how you do things so thanks for sharing that. I am intending to make my little house looks slightly Nordic too, I love that style and look forward to seeing more of your house. Espero que el nuevo libro tenga muchas ventas!!!! La casa se ve preciosa,seguiré tus avances,contigo siempre se aprende!!! Ах Каролина! Вы так добры! Спасибо, что делитесь своим мастерством! It is so kind of you to share your techniques, Caroline, thank you! 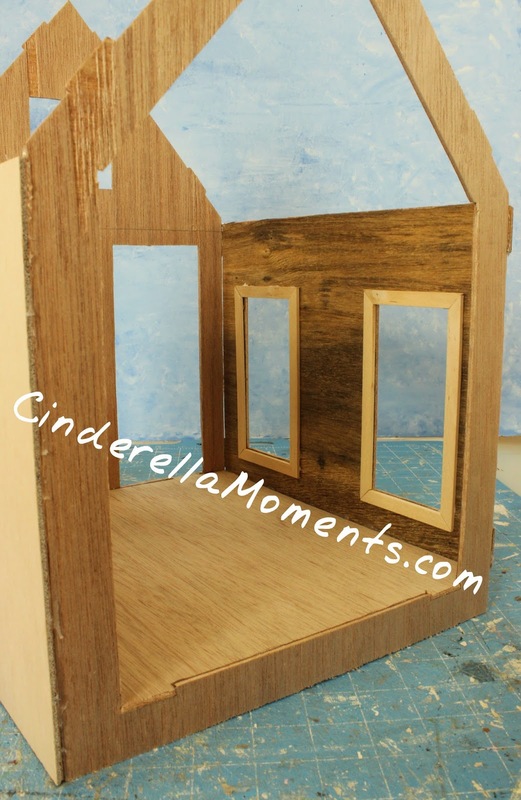 This new house will be just as wonderful as all your other dollhouses. Ohhhh, a Nordic house! This sounds very intriguing:) I can't wait to see more! The name of your new cottage is very inspiring! I can not imagine how beautiful it will be, but it certainly will be. Have a good work! Espero que sea un éxito rotundo y que vendas muchísimos. I do have your book on PDF and really must have a go. In the meantime I look forward to seeing progress on the tranquil Nordic retreat - sounds blissful. Seguro que tendrás mucho éxito con el libro, todas tus casas son preciosas. Estoy deseando ver los avances de la nórdica, se vé genial. Gracias por compartir y un abrazo. I know there was that book around and I've been looking and thinking of it almost everyday....I'm almost sure that book will be part of my collection soon!!! :) :P Even if I will never make a full house from scratch but just to know how these are made. Thanks anyway for sharing your knowledge, I'm sure many many people are delighted that this book is now out!!! 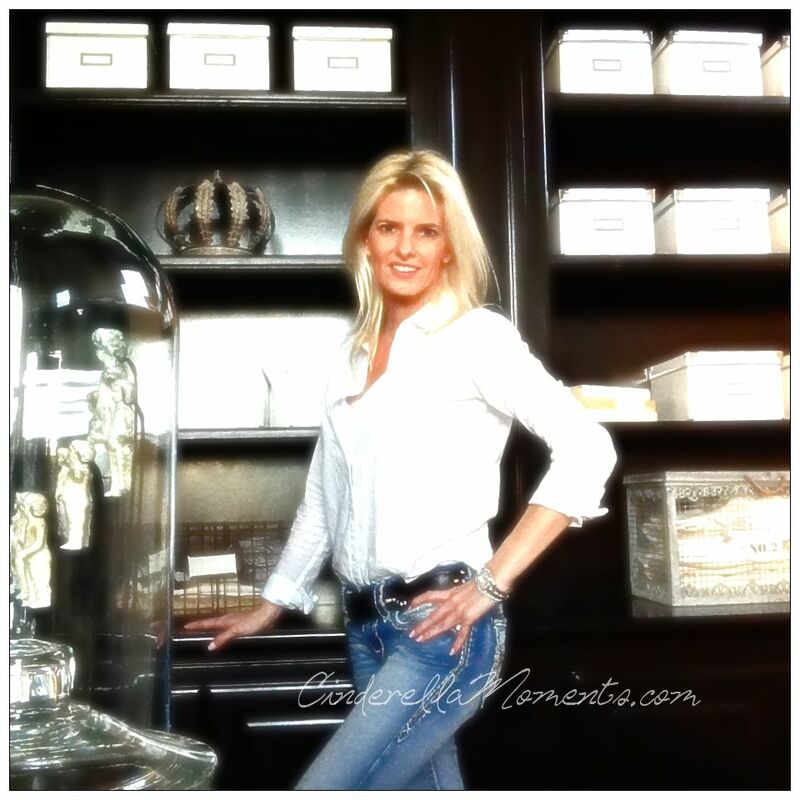 Big hug Caroline!